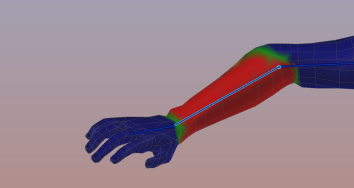 But when you move the lower arms instead of the wrist bones, then the hands still move along with the arms, although most vertices are only weighted to the wrist bones! This is because the Wrist bones are children of the Elbow Bones. 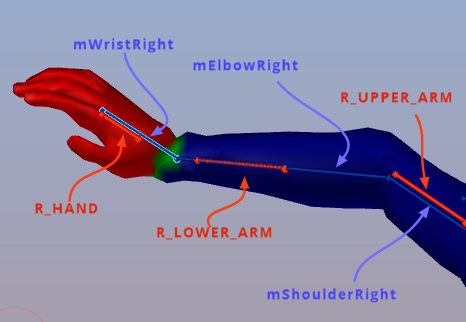 When the elbow bones move, then also the wrist bones move (because of the bone hierarchy). 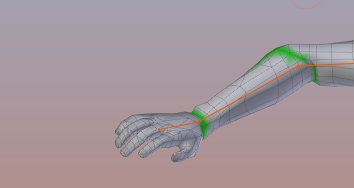 And because the fingers are weighted to the wrist bone, they move correctly along with the arm. 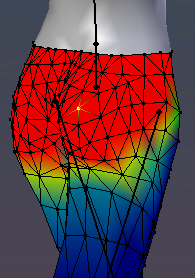 When you put all of this together then you realize that most of your vertices have only one weight (indicated as red area), while near the joints the vertices typically have no more than 2 weights. 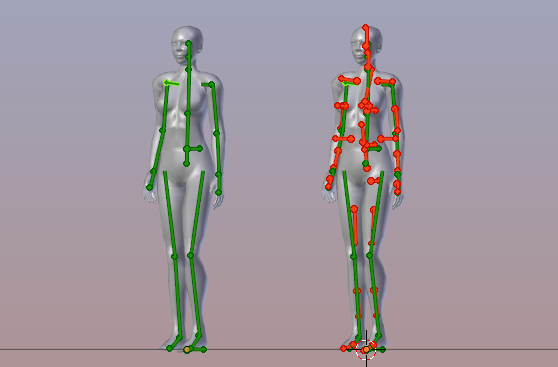 In fact we have seen above that the original SL Avatar has no vertex weighted to more than 2 bones. 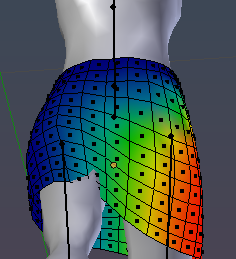 And when you look in more detail then you see that the areas where a vertex has 2 weights are always close to the joints. Does this make sense now? And then tweak the values of mPelvis and mHipRight. And while we are working on this also switch to other verts, clean up small weight entries and tweak them as well. 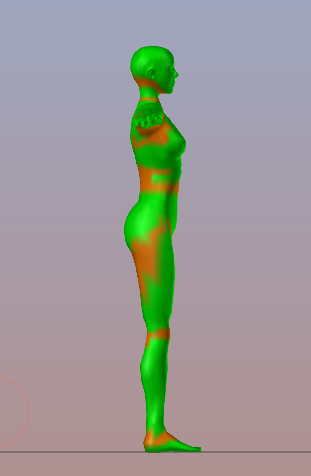 After a couple of minutes and after tweaking a few verts we end up with something like in the image to the right. this is better, but still not good. Why that ? 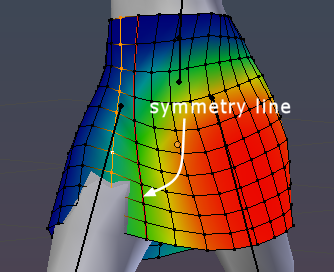 For better orientation I have placed a seam marker on the symmetry line of the skirt (the dark red edge loop, see image). 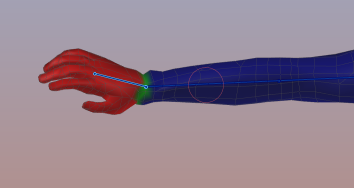 And I moved the timeline to 30, that is where the poke through is maximal for the right leg. And furthermore I have selected the edge loop that needs the most fixing. We now must lift the bottom of the selected edge loop above the leg’s surface. We will do that with the Levels tool. It can add a constant offset to the weights of the current vertex selection. 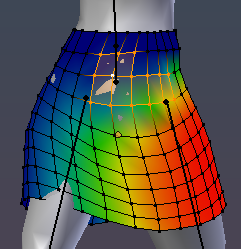 and it can scale up the weights of the current vertex selection. 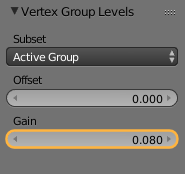 Ensure you have selected the mHipLeft weight group (in the Vertex group List). In the tool Shelf, in the Weight Tools Panel, find and call the Levels Tool. 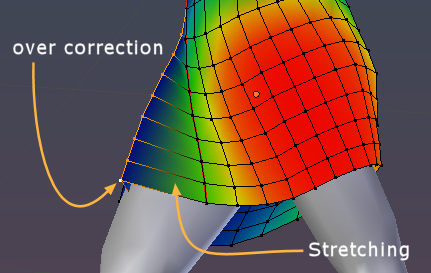 And in the Operator panel lower the gain until the surface of the skirt gets completely pulled out (that happens around Gain = 0.08).